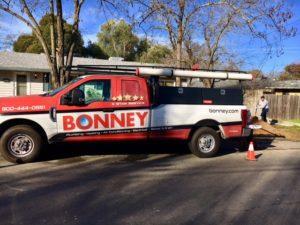 A valued Bonney customer in Citrus Heights had a major sewer back-up in their mainline. The kitchen sink, washing machine, and toilets were all backing up. That’s when they called Bonney. The first thing our Bonney 5-star certified plumber did was test the laundry line in the garage. He found it was clogged and not draining. 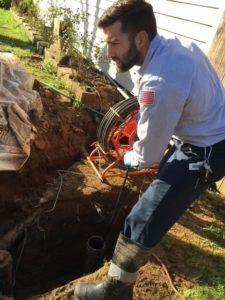 When our 5-star certified Bonney plumber went to the closet and opened up the crawl space to investigate further he found the real problem…approximately five inches of standing water and sewage from the sewer and drain lines. Not to mention all the rain water from the recent storms that blew through the Sacramento area. The homeowner, Jennifer, was a bit overwhelmed, “I had to walk away, it was quite a blow”, she said. When there’s heavy rain the sewer system can also become overwhelmed. The water can’t get through the system fast enough and it begins to back up, sometimes causing sewage to come up through the drains. Clogged or broken sewer lines can cause similar problems. Most homeowners aren’t regularly checking their crawl space for water. It’s not something most people think about. Standing water underneath the home can create a lot of problems…especially if sewage is involved. Wood rot, mold, mildew, and high electric bills can also be caused by crawl space humidity. This can not only lead to serious property damage, but to health issues as well. The good news is it can all be restored by our Bonney 5-star certified Sewer and Drain team at Bonney. Firstly, a local restoration company had to come out for immediate removal of the sewage backup under the home before Bonney could replace the sewer line. Bonney used trench-less technology to replace the existing sewer line with new High Density Polyethylene pipe. It’s Bonney’s 5-star pipe bursting technology! The purpose of Bonney’s trench-less method is to not disturb the landscape too much so when the job is done, it can look good as new. The front lawn is the husband’s pride and joy! Problems went away because Bonney saved the day! Bonney was able to turn tears into cheers for a family in Citrus Heights with 5-star sewer & drain service.